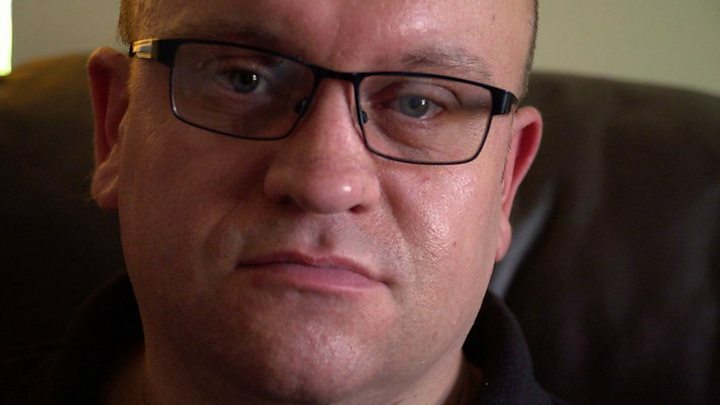 Male infertility is now the most common reason for couples in the UK to seek IVF - but when Craig Franklin was told bluntly that he had no sperm, he felt alone and emasculated. "The GP essentially said, 'You're producing no sperm, you won't be able to have children. Out the door, away you go,'" the 39-year-old explains. "There was no support whatsoever." The effects hit him hard and almost led to him breaking up with his partner Katie. "I was very angry for a long time. I went mad with money," he tells the BBC's Victoria Derbyshire programme. "My performance at work deteriorated quite significantly to the point that I lost my job late last year." "It broke my heart. I saw a man break, basically," says Katie. "He didn't feel like a man, and that's so unfair." Leading fertility expert Prof Sheena Lewis - chairwoman of the British Andrology Society that aims to improve care in men's reproductive health - says the lack of focus on male infertility within the health system is an "urgent" problem. "Men are not being looked after properly, not diagnosed, and not cared for," she says. The quality of men's sperm in the Western world is in decline, but little is known about how to improve it - and there are few treatments available on the NHS. This has led to an "absurd" case, says Prof Lewis, where women routinely have to undergo IVF - even if there is nothing wrong with their own fertility. "The woman actually acts as the therapy for the man's problem [of poor sperm]," she says. "We are giving an invasive procedure to a person who doesn't need it, in order to treat another person. That doesn't happen in any other branch of medicine." Prof Lewis adds that it is also a "huge expense for the NHS", at a time when IVF is being rationed in many parts of the country. One couple, who spoke to the Victoria Derbyshire programme anonymously, might never have had their son had they not explored other options privately. On the NHS, they were given a round of IVF - despite the female partner having good fertility - but it failed due to the man's poor sperm. "It was really unpleasant. Injecting yourself with needles that don't go in the first time is not a walk in the park," she explains. So instead, the man sought the help of a private clinic and had an operation - cheaper than a round of IVF - to treat varicocele, an abnormality in the scrotum that affects up to 40% of men with fertility problems. His wife conceived naturally. For Stephen Harbottle, a consultant clinical scientist who helped develop the fertility guidelines for health watchdog NICE, while varicocele treatment will not work for every man, the NHS must ensure other options are explored before IVF is offered to a couple. This includes simple solutions such as dietary supplements, or tests to check for sperm DNA damage. The reason this does not happen currently, he says, is that "doctors don't have any other options available other than to refer patients for IVF". "Men in some ways are just being farmed through the system," he adds. Some men with fertility problems also report feeling sidelined by GPs, who they say focus on the women. Mark Harper - from Ilkeston in Derbyshire - has two children through donor sperm. But when he was originally found to have no sperm, it was his wife whom the doctor called with the news rather than him. "If you're talking to a male about his infertility problems, you ought to be talking to the male about it," he says. "I'm here, I'm a person, I was the one sitting in front of you, and I'm the one you need to be talking to." The Royal College of GPs said in a statement that its members were "highly trained to have sensitive, non-judgemental conversations with all our patients... including why someone might have problems with their fertility and the best options for them going forward". Prof Sheena Lewis says the lack of attention on male fertility also means men are not educated on their reproductive health, and may wrongly take it for granted. "Men do have a biological clock. As time goes on, because of their lifestyle, there are more and more opportunities for mutations to occur in their sperm. "Men who are over 45 when they have children are more likely to have children who will have childhood cancers, or may have psychiatric disorders such as bipolar disorder or autism," she says, adding that she believes this is also likely to be the case for younger men with poor sperm quality. Katie and Craig say doctors presumed the reason they were not able to conceive was because of Katie - and she was tested before Craig's fertility was ever considered. The couple are now looking for donor sperm privately, having been denied IVF on the NHS. The stigma surrounding male infertility means this is the first time Craig has ever spoken openly about the issue - until now, even his friends did not know. "It's not a manly thing to discuss," he says. "It's boxed up... and not spoken about." The couple say it took them a year-and-a-half to come to terms with not being able to have children without donor sperm - made worse by the fact emotional support was never offered to them. But now they are coming through it. "We're stronger than ever," Katie says. "But other couples might not be as strong as us. They might not be able to work through that and I can see why - it's so hard for the man to be able to come to terms with not being able to give his wife a child."